We watched the RAGBRAI spectacle for a while, but eventually I motioned that we should move along to the convenience store and resupply if anyone needed to. That we did, and we negotiated about a half mile of anti-RAGBRAI traffic flow to get to our turn off and back into the hinterlands. This was going to be a dark place for me. That I knew what was coming wasn't any solace, since the day was brutally humid and the temperatures were in the mid-80's by this time. We crossed the old iron bridge as we rode over freshly spread gravel for several of the opening miles of this sector. Not as many tiger lilies as '09. The climb up out of Hawk Road isn't all that long, thankfully, but it gets progressively steeper as you go. I was trudging up this one tailing Michael Lemberger who was ahead of me by about a 100 yards. The crew had crossed the county black top that was on the RAGBRAI route as well, and were all waiting on the other side. I rode across and as I rolled up to them I said that I was cutting them loose. I knew I could make the route, but I was going to be walking every climb from here on out, most likely, and I didn't want anyone to feel hindered by my slow pace. Kudos to them, as they all agreed that we were in it together and that they were willing to wait on me. So it was that we soldiered onward. Hawk Road continued to climb, then Hamlet Road gave no quarter. Finally a short, fast down hill to Fantail Road on Glacier Road and a tiny respite of flat to rolling territory until Fantail kicked upward to an 18% grade. Check out the hazy sky. The heat and humidity were double nasty! I was first off the bike. I knew better than to throw myself at this beast and walking wasn't really helping either. Really, I had no choice but to walk as the lowest gear on my bike was laughably too high for anyone to try this after 90+ miles. Not on this course on this particular day. Michael Lemberger was off next, then Aaron Schnee. The rest of the guys were up around a bend out of my sight line. I had to stop halfway up to cool down. I was over-heating very badly. I could barely put one foot in front of another, but I was super determined to finish out. After the Fantail Road climb we had one more nasty ascent out of Bixby Preserve and that was it. The rest I probably was capable of riding. I was sure I could get this done. At the top of this climb I would have a hair over 20 miles to go with plenty of daylight to get it done. I ended up sitting here near the fence. Jeremy Fry shouted something. I looked up as I heard tires on gravel getting nearer. As I looked up, Dan Buettner was flying in the air, a bike was flipping away by him, and the Silverado was coming straight at me. I turned away at the last second, was hit, and flew through the air, landing on my back in the grassy ditch. The truck then hit Aaron Schnee's bike and suddenly stopped. I was dumbfounded, I had no idea why someone would be trying to take us out. That was my first reaction, but that changed. As I sat gathering my wits about me, Tony McGrane, who is a professional EMT/Fire rescue by trade, asked if I was okay, and told me not to move. Suddenly loud voices were being directed at the driver. He wanted to pull away, and the guys were pleading with him to shut off the truck. He was jerking the rig back and forth, with Aaron's bike wedged just underneath the front end. Finally the driver calmed down a tad, but even I could tell he was acting like he was extremely intoxicated. Aaron managed to dislodge his bike from under the truck. Then the driver asked if I was okay, and Tony shouted that no- I wasn't, and that the guy needed to stick around. Apparently fear got the best of this fellow and he sped away down the hill. Not before Michael, Jeremy, and Tony had images of his plates and truck. Then we all were just shell-shocked. Attention turned to me and Dan to see how we were. I was under advisement from Tony to stay put until the EMT's could evaluate me and then I could decide what should be done, but Tony was pretty adamant that I get looked at. He saw me flying through the air and was concerned. I decided to take his advice, even though I just felt banged up, not really hurting at the moment. I had two superficial cuts, a couple of bruises on my elbows, one on my knee, and my shoulder felt janky. My kidney area felt sore where the truck hit me. Dan seemed okay, a chainring tattoo was his only mark and he may have gotten cut a bit. Later I heard he dinged his head on something when he was knocked into the ditch. My bike and Dan's bike were essentially okay. Aaron was not as lucky. His bike suffered damage and his helmet was squashed under the truck's tire. Fortunately he was no where near it. As the story unfolded a young teenager on an ATV rolled up and offered to go get help. Tony called 911 and the dispatcher had a hard time figuring out we weren't on RAGBRAI. Meanwhile, the rest of the crew was telling their versions of what they saw and as far as we could discern, the facts seemed to point to this fellow passing out/falling asleep as he idled there and his foot slipped off the brake, allowing his truck to roll down the hill toward us as we stood right at the road's edge. We figured the driver was jolted to awareness by hitting me or hearing Aaron's bike getting drug underneath his truck, or getting slowed up by Aaron's helmet. Not the guys you want to see on your gravel ride. That said, these men were awesome and much appreciated. I don't know how long it took the authorities to reach us, but it was a long wait due to the chaos of RAGBRAI, our situation as cyclists in an unlikely place, and the remote area we were in. No harm though, as I wasn't in dire need. The paramedic that examined me advised that I get X-rayed and cleared by a physician due to the nature of the accident and what not. So, I got hauled away in an ambulance and that was the end of riding the 2014 GTDRI course. My story ended as well as it could have. No severe injuries. No broken bones. Just sore and banged up. I'll be fine eventually. The rest of the gang got hauled away to Edgewood Fire Department. Dan and Tony got a ride to Backbone, where they got their vehicles, drove back, and ferried all the guys and bikes back to their cars. Jeremy Fry, who had ridden with Mike Johnson, drove my truck back home and they brought my belongings with them. My wife and son came out to get me. The driver was arrested, charged, and admitted to the crime. Now I know it wasn't my fault, but I want to offer my sincere apology for how this all turned out. It could have been much worse, but I never wanted to see it end anything like this either. Thanks to Mike, Michael, Jeremy, Aaron, Tony, and Dan for coming on this adventure. Thanks to the Edgewood Fire & Rescue, Iowa DNR, Iowa State Troopers, Regional Medical Center at Manchester, the driver and paramedic of the ambulance, and anyone else I forgot for helping us out and nabbing the suspect. Thanks to my wonderful wife for fetching me. Needless to say, I feel very blessed and fortunate to come out of this one nearly unscathed and that no one else was seriously injured. Rolling up to the heart of Elkader, Iowa we clocked in at 68 miles. It was 11:45am. I was stoked. I figured that we made up about 45 minutes to an hour on time coming from Wadena. It was an up-lifter, because now we could lounge around and not be in such a hurry to get out of town to get in the final 48 miles. That doesn't sound like many miles, but these miles would by far be the hardest of the entire ride. I was also stoked that I was able to continue to stay hydrated and not get hungry. The chips at Wadena and the chocolate milk actually worked well. Now it was time to sidle up to the tiny burger shack and order up some grub to chew on. "2 Mitts" is a funky joint made from a travel trailer and from its little enclosure comes boiled hamburgers, brats, or hotdogs with or without onions and cheese. Order up a bag of chips and a soda. That's the menu. It was told to me that 2 Mitts is a very popular joint there in Elkader, and by the looks of the line of folks that constantly were there waiting on some boiled goodness, it was probably a true statement. I got a cheeseburger, no onions, and a root beer. (I still had a half a bag of chips from Wadena!) I set down at a shaded picnic table and chowed down. It was a perfect amount of food. Then a trip across the street to the convenience store, a much better stocked and modern one than Wadena's, and purchased some peanut butter crackers for later and a purple Gatorade along with a bottle of water. Topped off the fluids and I was ready to go. Ah...no! You cannot lick my ice cream cone, Jeremy! Michael Lemberger and Jeremy Fry behind 2 Mitts in Elkader. Big views, more flowers, and heat. Just East of Elkader, Iowa. We spent about an hour at Elkader and then it was time to mount up and get after those big climbs. Things started out nice and easy with gentler grades and a couple really fast down hills. The views are spectacular out here and I was reminded once again why this course has been a favorite of mine over the years. "Brutally Beautiful" is how I like to describe it. The hills are tough and you hurt bad with the heat and efforts, but the payoff is grand. Descents are hairy and fast. Michael Lemberger said earlier regarding the climbs and the "pay-off" afterward: "This is a currencty I could get used to." Works for me! I wonder if the heat and light company would trade hills bagged for electricity and gas? I am pretty familiar with this country having ridden it twice before and reconned through this area a few times for Trans Iowa and the GTDRI. I didn't need cue sheets! Plus, I knew what was coming. Hills were going to get steeper and the weather wasn't cooling off at all. In fact, even the wind went away. Probably a "worse case scenario" for me, but there was nothing I could do but pedal onward. So, that's what I did. It was slow going on some of the climbs because it was like single speeding with too tall a gear. Grape Road, Harbor Road, and over toward Ironwood Road, (which is paved now, but wasn't in '09-'10), and the climbing was brutal on the Tamland. I handled it all okay, but it was slowly taking a toll on me. I could feel my core temp raising little by little, and with no breeze and full Sun, it was tough to cool down on anything but a 30+ mph down hill, which didn't last long enough! The country out this way was really "open" as well, which left no where to hide from the elements. It was also the highest elevation point on the ride, so we could see for miles away from the ridge tops. The turn off to Ironwood Road was where we all stopped to gather up again. Then it was off on a bit of an easy stretch on pavement toward our first B Maintenance road of the day. Imperial Road. A nice steady climb through the trees to start out with. The tamest section of Impala Road. I didn't dare take any images while descending the gnarly bits! Imperial Road is the tamest of the two B Maintenance roads on the course. It is pretty much a straight shot at a gentle upward grade. The rocks are bigger here and most of the lane is going through a shaded area, which was nice for a change that day! Up toward the top; however, things changed. The trees go away, and there was fresh, fist sized rock spread across the entire roadway. Still going upward, the Tamland's lack of a low gear made for really stupid efforts to be expended just to stay going forward. In an effort to conserve energy, I got off and walked a bit. At the end of Impala Road we ran across the RAGBRAI route again. Then it was another "up-down" on gravel, a Left On Ironwood Road again, and a bit more pavement to Impala Road, where we would hit one of the most unique B Maintenance Roads in the State. Impala Road starts out with a roller coaster down hill where you can easily reach speeds over 40 mph, then it goes right back up as steeply. The climb got me off the bike again since by now the heat and gradients were just too much for me and my bike's gearing. As I was walking along, pushing the bike, a Chevy Tahoe with a bike rack and bike on the rack stops up, rolls the window down, and the man inside says, "Well! You guys are the real Ironmen riding out here!" I replied with, "Well, either that or we're complete idiots!" The guy then explains that he wants to drive his Tahoe down Impala Road to Garber. I tell him that while the road does indeed go to Garber, it would be a very bad idea to drive down it. That is because Impala Road turns into a legitimate DH course for several hundred yards. The rocks are big, the pitch is pretty steep, and there are ruts, sand, and mud in places. We picked our way carefully down at a snail's pace to avoid pinch flatting. It eventually comes down to pass beside the Turkey River and levels out, but there were mud holes and washouts to get around as well. We passed an Amish buggy and saw the horse and driver in the river cooling off as we rode by. Then we got dumped out onto a chaotic scene- the RAGBRAI route was passing by on the black top we intersected at the end. Tomorrow: The last installment of the GTDRI report, and the most bizarre thing that has ever happened on any ride I've been on will be discussed. It ain't much but it is what Wadena has got. No credit cards, by the way! I got some stuff here but my mantra going in was to eat less but eat more often. It was working for awhile, but coming into Wadena, I was hungry, and the bottles of Hammer Perpetuem weren't cutting the mustard. I was going to need to call in some reserves. I got a piece of string cheese, a small two serving size bag of salty potato chips, a Salted Nut Roll for later, and two bottles of water. I ate about half the bag of chips and stuffed the rest into my jersey pocket for later. The water was just enough to top off the bottles. Maybe I wasn't drinking enough water.....hmmmm. I also had a cup of chocolate milk that Mike Johnson kindly shared. Up over the rollers Northwest of Wadena Iowa. The dog that wouldn't quit! Said pooch was not aggressive, but was wanting a fine run with like minded companions. We looked to fit the bill, so along the dog came, letting out bursts of whines and weird "happy sounds" as it darted amongst Michael and I, then on up the road after the rest of the gang. It was a good thing, in a way, since it took my mind off the Tamland's too steep gearing and Michael and I actually started to reel the guys up ahead back in a bit. Then they reached the corner where we were to turn left and eventually, down steeply to Echo Valley Road. The pooch had survived about 4-5 miles of hot, humid running after us, and showed no signs of giving up its new-found running mates anytime soon. Much to our dismay and against our admonitions to the dog to go home. I liked this dog, but it was time to get it off our tail. It was running in front of us erratically, and well......we didn't want it to get lost or run over by a vehicle. Despite our best efforts, the determined mutt stuck to us, and was lagging by a quarter mile after the 40mph down hill, but was still coming! There was a right hander, then a curve and a low rise in the road. If we could just get out of sight, maybe we could ditch the poor dog. Echo Valley Road. Beautiful valley scenery and killer fields of flowers along here. Don't make a false move here in your car, or you could easily end up in the Turkey River! Round bales along the Turkey River on our way to Elkader. We did finally ditch the pooch and we faced ahead and motored along. This was the approximately 20-25 mile "flat" section of the ride. It had a few rollers, but basically this was pedal, pedal, pedal to Elkader and lunch. We were clipping along at 14-15 mph most of this section and we made good time. The crew checks out this unusual barn and farmstead along the road to Elkader. In fact, we made such good time that we actually arrived in Elkader by about 11:45am. I was really happy and really surprised by that fact. Now it was on to finding some grub and restocking on supplies to hit up the last half of the GTDRI course for 2014. The GTDRI of 2014 started out in the valley of Backbone State Park at 6:02am after some blathering by myself. I and the six others crawled up the paved road out of the park and into a hazy, humid, almost wet day. The mood was good and we had a great group of guys gathered together. A couple of surprise showings in Dan Buettner, who decided to come over dinner the evening before, and Aaron Schnee who lives in Lincoln, Nebraska, but was up visiting relatives in the area, so he drug along his bike and showed up to ride as well. Michael Lemberger was in from Madison, Wisconsin, and Jeremy, Mike, Tony, and I were representing the Cedar Valley. A really strong group of riders and I knew I had my work cut out to be able to keep up with them. The first part wouldn't be too bad though, since it was relatively flat and there were paved sections coming into Strawberry Point and leaving there. "First gravel" wasn't hit until almost three miles into the route. We passed by the Backbone Bluegrass Festival, and it looked pretty busy there already at a little past 6:00am. While it was tempting to turn left into the venue, we kept rolling! Our first "encounter" with RAGBRAI. It wouldn't be the last one! Coming into Strawberry Point we saw lots of activity. Tractors, banners being unfurled, things being roped off, and the great smells of cooking outdoors as the community was readying itself for the onslaught of RAGBRAI riders. They would be going in the opposite direction than we were going. This prompted many a "You're going the wrong way!" comments from the locals and a few RAGBRAI front runners that had already made it to Strawberry Point. Our reply became, "No, we're going the RIGHT way!" Which bewildered the folks that heard it. No time for explaining, and we rolled Eastward out of town and quickly back to gravel roads again. Our first major road was "Amission Road", or in old parlance, "Old Mission Road". It is an oddity in a state of roads set on a grid, since it was an early Army road, then an important route to ferry supplies and people to the Northern parts of Iowa as settlers came in after Statehood was granted in 1846. It wanders Northwestward out of Strawberry Point for several miles before it eventually disappears into the gridwork imposed by the government. Our time on Old Mission Road was notable for losing track of two of our riders, Michael and Jeremy. It turned out that their "nature break" ended up becoming a flat tire repair for Michael. We were just heading back down the road to find out where they were when we saw them coming back to us. Old Mission Road escapes the grid, but not forever! Barns for Jason: Michael Lemberger checks out a family farm's barn. Big views early into the ride near Volga, Iowa. Leaving Old Mission Road behind we went North and the Eastward over some "roller coaster" hills that were a precursor to the fast descents and insane grades that we would face later on. Then it was the Right turn onto St. Sebald Road that catapulted us upward to a place where the views were spectacular. The cloudy conditions were breaking into a sky with patches of blue and the heat was slowly ratcheting upward. I found my Raleigh Tamland's gearing to be lacking. It was going to become a big liability on the hills coming up later. For now, I just had to get up and over these first bits and to a big sector of flats coming later. We made it down to Volga, a small hamlet on the Volga River, and cruised through and back Northward. The road bent West a bit as it hugged the Volga River and then it was past the hill where on Trans Iowa V4 we came across a mudslide that blocked the road and where we had riders scoot over the mud and debris. Oddly enough, Aaron Schnee was on that T.I. and remembered the incident. Moving past that point, not very much further on up the road, we came upon a crest of a hill, and much to my surprise the riders in the front decided to stop and we all ended up taking a break. It was really humid, and the heat was beginning to make us feel our legs and I guess it was good to stop and cool down. I was a bit concerned about not getting to the lunch stop before 12:00pm, but there was plenty of time to go before we got to Elkader. Wadena was our town to first stop and refuel and we were all wanting to get there to resupply on water and maybe find something to eat. The last stretch to Wadena was a straight shot Westward on relatively easy road, but as I remarked on the ride, I don't know why those miles there seem to take so long. Then it dawned on me. You cannot see anything off to the sides as the road is lined with trees for much of the time through there. It makes seeing progress harder. Or not. Just my theory there. It was a long, long day! The 2014 edition of the Guitar Ted Death Ride Invitational will go down as one I'll never forget, and I bet the other six guys with me would say the same. It was a long, long, day, and not because we were riding. I'll explain in Part 2, but for now I will leave it at that. Tomorrow I will get into an in depth report, but for reasons I will explain later, I will be taking a full day of rest before I get to talking about this ride! 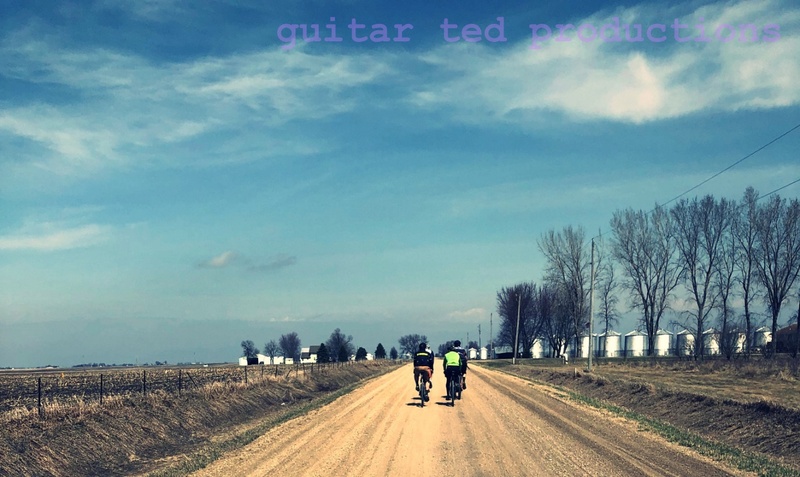 Getting Ready To Ride: The Guitar Ted Death Ride invitational is set to go off tomorrow at 6:00am sharp from Backbone State Park just South of Strawberry Point, Iowa. I polished up the Tamland Two for the ride and since it only has two water bottle cage mounts, I will likely attach my Revelate Tangle Bag and either throw in a bottle and stainless canister for cold drinks or use a bladder. I'm digging the canister idea for this ride. Anyway, I was checking out the RAGBRAI route and whattaya know? It goes through Strawberry Point and Garber Iowa, both towns on our route. No, no.......I did not plan it that way, but we will likely have some "ragbree traffic" to deal with at a couple points. I'm certain that if that happens it will make for some interesting interactions. "Having fun on RAGBRAI so far?" "Nope. I'm not on RAGBRAI. I'm on the Death Ride." Or something like that! Look for a full report starting Monday. What The What? No New Warbird? The biggest downer for me from the recent Saddledrive coverage was the lack of any changes on the Warbird. Salsa Cycles flagship "gravel bike" basically carries over from 2014 unchanged for the most part. I'll make no bones about it, I think the Warbird V1 is flawed. I know others who are really into gravel riding and some other folks I know in the media feel likewise. It could be the "go-to" gravel rig, but in my opinion, (and that of others I know), it needs an overhaul. And here's a question I haven't heard discussed much: Why is the Colossal, (Salsa's long distance road rig), a steel bike and the Warbird is an aluminum bike? Furthermore- Why should Salsa have both bikes when one model could easily do both tasks? Not that Salsa Cycles would ever listen to me, (cause they have smarter folks running the show than I), but why not make "one bike to rule them all" with 42mm tire clearances, a steel frame, and gosh darn it- a real, honest to goodness lower bottom bracket!! 70mm bottom bracket drop is not "low" folks. It just isn't, and gravel bikes and long distance roadie rigs should have a lower drop than that for ALL sizes. Salsa could make this "one bike" outta steel, give it a 71.5° head angle on the larger sizes, slacker on little sizes, and call it good. Salsa Cycles doesn't need two bikes for "all road riding". Don't like big tires? Fine, run 28"s. But for those that need 'em, they could. Not a Vaya. That bike is over-built for a purpose of touring. But yeah......I get why that makes sense too. It just doesn't need to be a touring bike. This "one bike" for unloaded riding could have a livelier frame than a Vaya. Okay- maybe a Vaya-lite? In Trans Iowa Masters Program news, there is a group of four including a couple of T.I. finishers and our first female rider attempting the route together today. No SPOT track available to follow here, so we'll just have to wait and see if they can make it. Sounds like the weather may be cooperative at least. Then we have two ITT, (Individual Time Trial) attempts happening in August. Mike Johnson has been scheduled for quite a while for the 22nd and a new one came across my desk yesterday. Allen Brunner, a Trans Iowa V9 finisher, will be making his attempt on the 15th. I've given it some thought, as far as extending the time limitations for attempting TIMP, but I think I'll not allow it. There just wasn't enough interest, and I feel that it should stick to the original plan of ending on August 31st. The TIMP was partly a celebration of Trans Iowa's past, partly a celebration of getting to my goal of doing Trans Iowa V10, so extending the date past the plan seems a bit "not right" to me. Not to say that something similar won't be offered down the road, but I haven't given that any thought now, and may never. We'll see. That's all for this week. Have a great weekend and I'll be back Monday at the latest from my escapades in Eastern Iowa. Keep the rubber side down and ride your bicycles. Just about succumbed to a Skeeter attack here! Last chance for gas with the Borealis before it has to go back to Colorado, so off to Ingawanis Woods I went. It was a gloriously cool, drier day compared to Tuesday which was a typically beastly, humid, hot Summer day. I was really happy that Wednesday was much better. When I reached the last road to the woods, I spied a 40 acre field of wild flowers and prairie grasses that I thought might make for a good image or two. Filed away in the back of my mind for later, I drove the last stretch to park and get ready for a quick lap on the carbon fiber 29+ rocket. Surprisingly, I found that there were few mosquitoes in the air in the grassy lot where I traditionally park there. Not like the last time, when brown whizzing clouds of the blood sucking insects wouldn't leave me alone. This was a good sign, and I planned to take many images and enjoy myself on the loop. I rolled off on the bone dry, rock hard dirt and scooted around the first few corners. I decided to stop and take an image of the rooty, broken rock infested climb near the counter-clockwise start, and I found out that this was a very bad idea. If anything, this was the worst the skeeters had been in years. Just awful! Okay then, pack it up quickly, remount, spin off, and forget about stopping. Nothing but flowers and bees out here! This made for a single stop running of the loop, which is pretty unusual for me, only because I usually feel the need to document a bike, component, or a beautiful scene with the camera when the mood hits me. I am not all about the "fastest time" or "training", for that matter, so I typically don't care about speeding through Ingawanis without enjoying the sights and sounds. However; the beastly skeeters put a different spin on this ride and I found myself grooving on cutting corners as fast as I could, or in not using my brakes as much. It made for the fastest times in many sections that I have ever had. The mood and techniques were one thing, but the bike played right into that as well. Big, 29+ meats, set up tubeless, were the meal ticket to eating up single track at an alarming rate. Whomever said 29"ers could not zap around tight corners never rode such a rig as this, that much I do know. I was flying through the tight twisties faster than ever, and conditions were not primo for traction either. 29+, (really, they are 31"ers), are so good at gaining traction, that speed in areas you typically have to scrub off speed in, or be careful with pushing too hard for fear of breaking away, are non issues. I was even cruising right past the sandy patches in the apexes of corners like they were pure, tacky dirt. Braking traction was insane, when you needed to brake, and whoa-ing up the Echo was no problem at all. I'll be adding a 29+ or a B+ bike to the stable for sure based upon this experience with the Borealis. And that flowery prairie? I decided to stroll on over on the Echo and visit for a while. It was a great, relaxing way to cap off a frenetic ride through Ingawanis Woods escaping the dreaded skeeter attacks. Saddledrive is when all the new Salsa Cycles product gets released now for the following year. I knew of a few things going into that due to Twenty Nine Inches and was aware that Salsa Cycles was about to announce a "5 inch fat bike platform". For those unaccustomed to "bike speak" that translates to a bicycle with enormous tires measuring approximately 5 inches wide. First off, I have noted that since I have had the Snow Dog that running into snow which I cannot float on has been a consistent problem. Even when I got the titanium By-Tor fat bike, this problem persisted. I had various upgrade scenarios in mind, but here's the thing: The Mukluk fat bikes were never meant to have that big, five inch wide tire on a 100mm rim stuffed between their chain stays. I could probably have fudged it, but drive train issues and clearances, and........Bah! So, I never got too serious about getting down to actually pulling the trigger. So, now the news is out on Blackborow. This suits my Winter escapades to a "T". 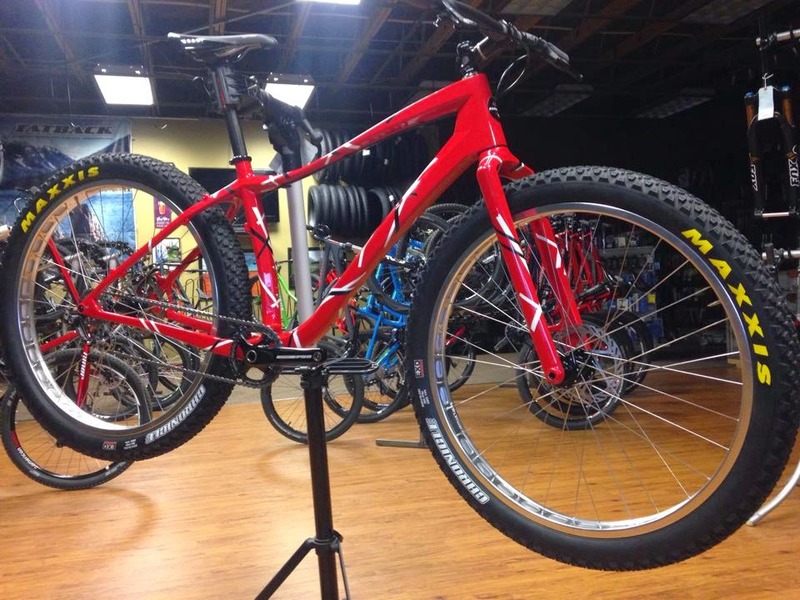 The widest rims and tires on a frame designed for that. So, what is it? A single speed? No.......it's a dinglespeed! If I end up with one- it may end up like this! A dinglespeed? Yep! Two chain rings, two rear cogs, (or as in this case, a single piece of metal fashioned into a double cog), and one chain which you can manually swap from one combo to the other. Ideally you get a "high" gear combo for faster, flatter terrain and a "low gear" combo for slugging it out on the hills and in the brush. If it is set up right the chain doesn't have to be re-tensioned or lengthened/shortened to accommodate swapping gearing combinations. The Blackborow is set up to do it without fuss. Now if I cannot deal with the dingle set up, I could always 1X the thing easily by getting a new, Right side Alternator plate suitable for the task. Then I could add a cassette, derailleur, and gears easily enough. Or I could tamper with the rear ratio a bit. Either way, the deal is that the wheels and tires are suited to my desires and the design is centered around those wheels and tires so it will all work well. Salsa did some nice detailing on this one too. Stainless chain rings, chain ring bolts in stainless, a stainless dinglecog, and a KMC Rustbuster chain along with stainless steel hardware in the brakes. That's nice because I saw what commuting did to my drive train on the Snow Dog and the brake hardware looks horrid. Nice going Salsa! This would help solve my maintenance issues with fat bike commuting as well. Sure, I could get a carbon fat bike this, or a suspended fat bike that, but this is the bike that would be practical in a "car replacement" sort of way and be my go-to rig for wicked snow conditions, which we seem to be plagued with often in Winter here. Not sure I can swing it, because, well.......these things cost money, and even though I feel it is a reasonable value, it won't be easy to scrape up the cabbage for this, and then....who knows when it would actually be available? If it works out it works out. But there ya go- that's why I like the Blackborow! 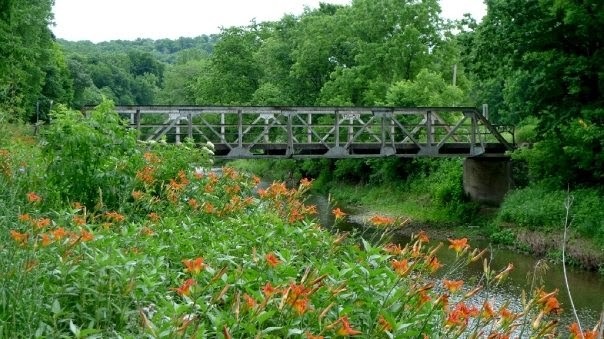 This bridge will be on the route this year. Here's the last update on the Guitar Ted Death Ride Invitational I will be posting here. For my previous update go HERE or see the "Official Site" of the GTDRI. In this post I want to cover some finer details of the event and the course in particular. First of all, the route cues were independently checked by two separate and unknown to each other sources and four miscues were identified which have been changed now. NOTE: If you copied the cues that were in bold type like this there are mistakes. Please go back to the GTDRI page for the 2014 cues HERE and re-copy them as they are certified to be correct now. Okay, with that out of the way, I wanted to give you my viewpoint on the route this year. As many of you may know, this is essentially a modification of the 2009-2010 version of the Death Ride which was a 118 mile loop out of Echo Valley Park. While I could just go and do that same loop again, the thing is, it doesn't accommodate a larger group of folks at the start/finish. Echo Valley Park is an amazing park, but it is primitive and lacks space to take on many cars for parking, and it isn't as accessible as I'd like it to be for out of towners. However; a park exists near the route that is both easily accessible for travelers and has amenities like showers and copious amounts of campsites along with parking for day visitors. Plus, it is a short way to a town on the route that could accommodate those wanting a motel. All I had to do was to modify the route slightly and it was a done deal. Only a hair over two miles shorter, at 116 miles, it will give us all the feel and scenery that the '09-'10 route gave us with a better start/finish to boot. Not only that, but in my view, it does something else which I think is a positive for the riders this year. It breaks up the brutal hills into smaller bites. The '09-'10 route started from Echo Valley Park with a few rollers which opened up the legs, but then it dove down a big sweeping hill, (where I about ate it at 40+mph in '09), and went pretty much dead flat for 25 miles. Then the route went into Elkader where we would eat breakfast, then we left and immediately hit some really tough climbs until we got a brief respite at Garber, then back into the frying pan for the worst hills of the route until we got just East of Strawberry Point, where we had another brief respite until we hit more crazy hills right up until the end of the route which was capped off by climbing the same sweeping down hill we had in the morning. This new version will start out benignly enough with an easier route up until about 20-ish miles where we hit big hills that were near the end of the old circuit. This will go on until we get another 10-ish miles in and reach Volga. Not far up the road is Wadena where we will stop for morning vittles. Rollers ensue until we get to a couple big hills then we dive down to Echo Valley Road on the same down hill we had in '09 at about 47 miles. Then it's an easy 20-ish to Elkader where we will break for lunch. You'll be here on this year's route if you come. After Elkader we will cruise a few easy miles then it's up to the highest country of the route and the closest we will get to the Mississippi. 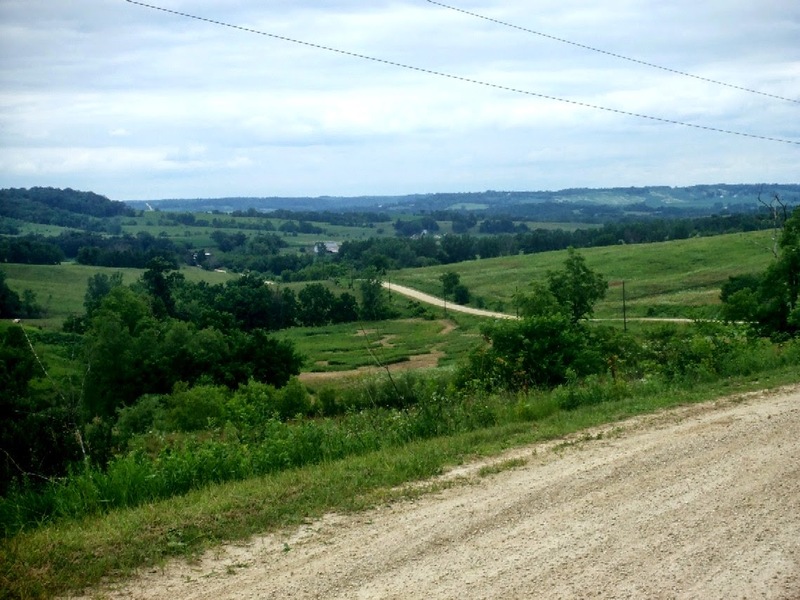 Down and up will become a familiar theme along with an insane dirt road which will drop us down to the Turkey River and a brief respite from hilly madness through Garber Iowa at mile 84.50. Better enjoy that brief rest because the steepest, longest climbs of the day await us after Garber. For the next 15 miles it will be a brutal awakening for those that think Iowa is flat at all. (As if you haven't been convinced enough of that before this point!) Fantail Road. That's all I have to say about that! The good news is that the last 15 miles or so of the GTDRI for 2014 is a lot easier than it was in '09-'10. Strawberry Point will come in again with about ten to go, so if anyone needs a last minute boost, we can get it there. We may very well need it! In '09-'10 we had to gut out the last 20+ miles with no resupply and no real resting points. Plus, we ended at a primitive area that had nothing for us to refresh ourselves. This reroute should address both those points well. So that about sums it up. The weather man is saying there is a possibility of showers Saturday morning, but no matter. I am going unless there is really severe weather. I'll be meeting any riders that show up at the river crossing in the center of Backbone Park on the main through road at 6am sharp to get the ride started Saturday morning. If you come as well, it should prove to be a good time. This is the tire due to come on many Trek Farley fat bikes. It will be a 60TPI tire with a tubeless ready bead and a 3.8" width with folding Aramid beads. 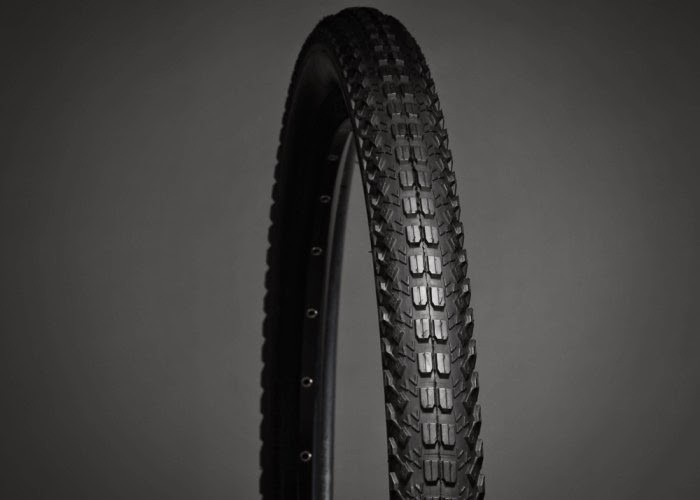 This tire is made to work tubeless with the Jackalope rims which are 80mm wide from Bontrager. No word on when or if these will be sold separately, but all indications are that this will be the case. Retail price is set at $149.99 for the tire. 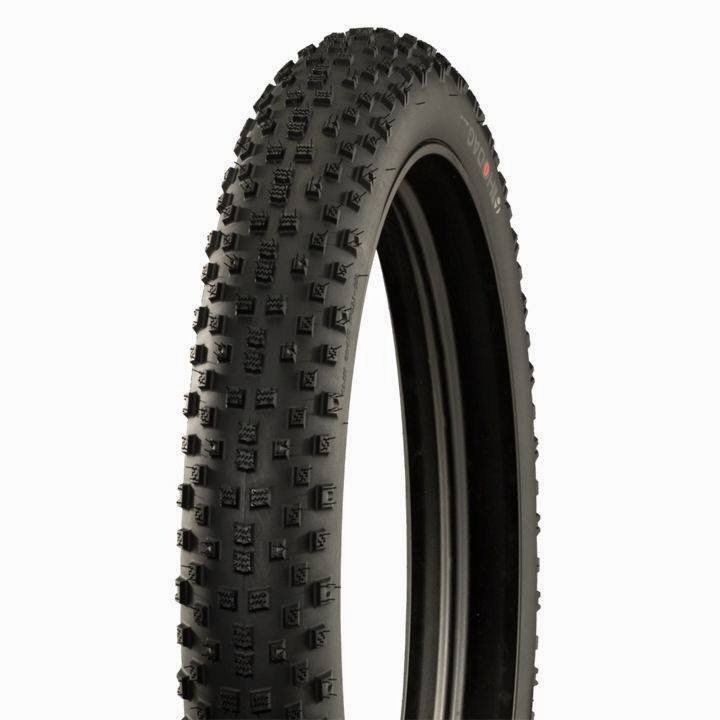 Comments: In a day and age when many fat bike enthusiasts are fed up with high tire prices and in combination with many brands offering similar fare at $50.00 less or more per tire, the Hodad will be a tough sell separately. While it boasts a tubeless set up with the Jackalope rim, I see this as only an advantage to those buying a Farley or upgrading one. Besides, isn't just about everyone looking for 4-4.5" tires now? More 29+ tires will be getting out there really soon and one of those will be the Maxxis Chronicle. Maxxis makes some decent treads so I suspect that this one will be well liked. Another benefit of the Maxxis mtb tires are that they generally convert to tubeless well and don't seem to show any ill effects from sealant. Commentary: One side note- Maxxis is a big OEM supplier, so you have to wonder what brand may have laid the foundation for this tire's production, as it is doubtful that Maxxis just decided to produce it of their own accord. Whatever the case may be there, it bodes well for 29+ that someone with the "horsepower" of Maxxis is getting behind it, even if only for a bit. Mammoth indeed! A Maxxis fatty. I've posted this here before, but it maybe needs to be mentioned again that Maxxis is also doing a fat bike tire dubbed the Mammoth in a 26 X 4.0" size. The tread looks like a modification of a Crossmark 29"er tread with a bit of the old Endomorph's webbed barring in there as well. Commentary: Once again, the existence of a Maxxis fat bike tire begs the question- Where will this show up and on which brand's fat bike? I just find it really difficult to believe that this wasn't made for an OEM customer, but again, I could be all wrong. The thing is, it is the right size and tread pattern for a stock, higher end fat bike from somebody. Then again, Maxxis has been known to put tire models out there fishing for OEM business, so the tire very well may have come first. This tire is a pretty well known entry by now, or at least it should be, but Vee Tire now has it on their site with details. Available as a 29 X 3.0 in 72 TPI wire or folding bead at 1025 grams and 980 grams each at $100.00 , $110.00 respectively. There will also be a 120TPI version said to clock in at 920 grams with an Aramid folding bead for $120.00. The B+ version will mimic the bead selection, prices, and TPI selections with weights as follows starting from wire bead/72TPI: 895,820, and 800 grams. The width on this one is said to be at 3.25", so wider than the upcoming WTB model in B+. Commentary: Vee Tire is pretty aggressive with tire introductions and the B+ and 29+ entries are really no surprise. I think the B+ model is too wide to be practical for swapping into current 29"er frames and with a current dearth of wide, 27.5"/ISO584 rims, it seems to be either a dead end tire, (for now), or it signals another OEM bike we don't know about yet. To be sure, wider 27.5 rims are coming, but they aren't quite here yet. (That said, by the time you read this a certain bike company may have made their announcement of a B+ sized rig, and that may change the landscape somewhat.) The Vee 29+ tire is another example of downward pressure in terms of price on a market that Surly has had to itself until now. It'll be interesting to see how that plays out in the future. This section was a fun one. I had decided earlier this year to get out and about a bit more as far as where I ride my bicycles. That's one of the reasons I ditched doing the 3GR this year. Yes, those are fun to do every Saturday, but they also had me pinned down to doing the same thing every season for two years. I felt like a change up was necessary. So, I had my sights set on riding at the LAMBA trails system in Beverly Park in Cedar Rapids for some time and Saturday I made that happen. I'd been there once before with MG back at the end of Winter when I attempted to ride through the snow on the Buzzard. The trails I did ride were very different than Ingawanis Woods. I was on the Buzzard, once again, and this time the Beverly Park trails were perfect. Dry, hard, and fast. Ingawanis gets like this as well, but the trails at Beverly Park are not as flowy as Ingawanis, which has a much more "wide open" feel. Beverly Park is a bit more tight, twisty, and definitely more technical. They also feature some structure down there. Not a lot, but Ingawanis doesn't have anything of that nature, so that stuck out for me. A bit greener than it was last time I was here with MG! The trails at Beverly Park feature signage indicating the trail difficulty level, which was pretty nice. I would say that compared to other trails I've been to that do similar things, these markings are on the conservative side. That's okay, as far as I am concerned, the main thing is that they are marked because there is a much higher level of difficulty involved in some sections of Beverly Park than at Ingawanis. Optional lines exist in many places at obstacles, but not at all of them. So, knowing which trails are "Most Difficult" may help make your day better. The trails are well kept, mown (mostly) and free of downed trees, limbs, and litter. I was very impressed by the condition of the trails in that manner. As for mileage, I don't do computers, Garmin, or Strava, so I don't have a figure on that, but I feel that it is at least good hour jaunt through there if you do most of the system. As for myself, I like going into a trail system with no map and just wing it. Getting a little lost is okay, but after a while I found myself wanting to wrap things up. I was not able to find the trail head after going around in a circle three times and finally I just cut out down a hillside to the road, which I knew would lead me back to the truck. I probably could have eventually figured it out, but I was under a self imposed time constraint. That said, if you go for the first time, it wouldn't be a bad idea to print out a trail map and take it with you for reference. The trails fold back in on themselves so much you can really lose your reference points! Smaller statured folk rejoice! (Well.....if you've always wanted a steel bike for bombing around on that looks like this) Surly has let it be known that a smaller wheeled version of the Straggler is on the way. This may be good news to you or someone you know. It will also be good news to tinkerers and those who want more 650B tires that aren't all "frenchy". It looks as though this bike will have 650B Knard 41's. I don't think "knard" is a French word, so this is why I find that it is different from most of the fare for this wheel size which seem to try to evoke some sort of higher brow, continental flair with their monikers. I don't think anyone will accuse Surly of being "refined" in that manner! The Guitar Ted Death Ride Invitational may be traveling through black bear territory. 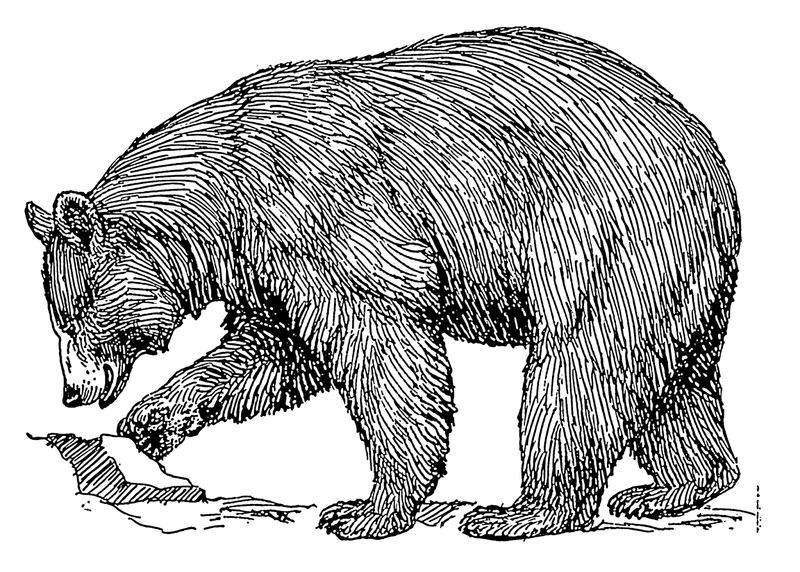 A recent news story circulated around this week indicates that near one of the pass through towns on the route a black bear and possibly two cubs are roaming freely around the countryside. While I think the likelihood of our small band of riders coming across such critters is small, it is a possibility since we will be riding in some of the more remote areas in Clayton County. I find this development incredible since during my time living here in Iowa we have gone from almost no wildlife beyond rabbits, racoons, birds, and muskrats to having abundant amounts of critters that were the furthest thing from my mind when I was a child. Bobcats, mountain lions, turkeys, and Bald Eagles are just a few of these that simply didn't exist, or were so rare as to be legendary when I was a younginz. Now we're talking about black bears? The DNR says that if this bear does have cubs it would be the first such instance on record in 140 years. Amazing! 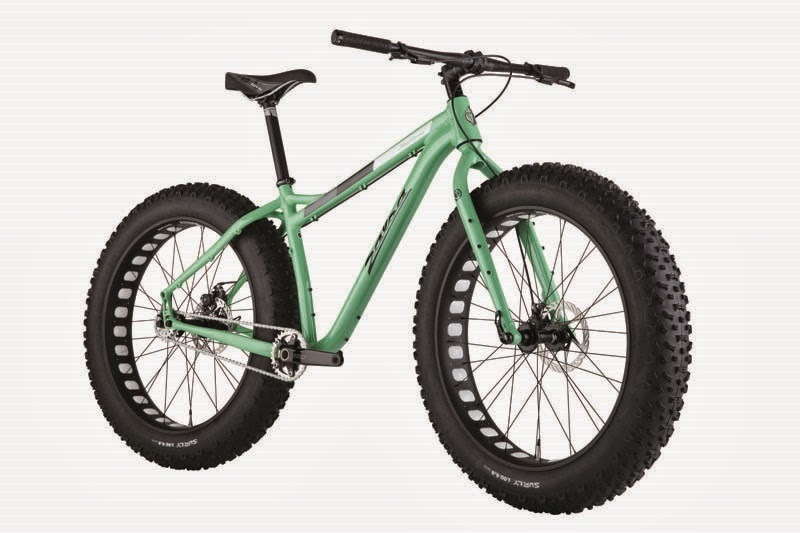 Mumbo Jumbo- Fat bikes are mainstream now. Back in late 2010 the fat bike riders were stoked to the gills because there was going to be one other fat bike tire available. There was the recently discontinued Endomorph, (a moment of silence, please), and the new "Larry". It was party time for fat biking as we knew it then. Now, not five years down the trail, there are so many tire announcements and models coming online to purchase that it is almost easier to say which companies don't make a fat bike tire than to name those who do. 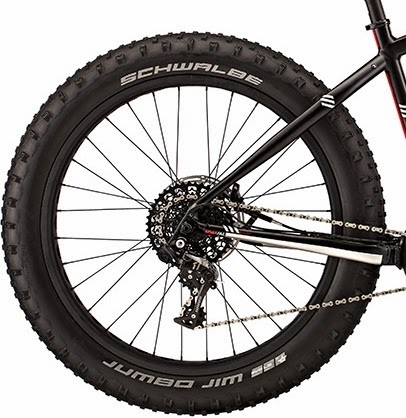 It used to be something of an inside joke to talk about when Schwalbe might make a fat bike tire. You know, if they did, fat biking would be done and gone mainstream. That would never happen, right? Right. Well........apparently fat biking is "over" then. 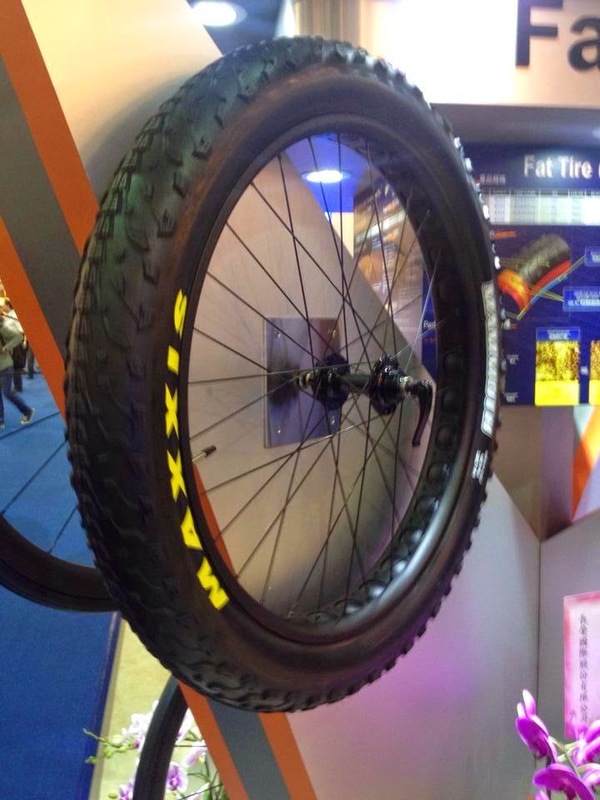 It looks as though Schwalbe is actually going to be producing a fat bike tire, or at least have one branded. In typical Schwalbe fashion, it bears a ridiculous name. All this seems so much like "cashing in" and manufacturers basically admitted to as much when the 27.5" bandwagon was cranked up a couple of years ago. No one wanted to "miss the party" like many did due to dragging their feet on entering the 29 inch mountain bike game in the late 00's. Certainly, by the looks of it, no one could be blamed for doing such with regard to tires for fat bikes! All I know is that in my simple mind the power of economics should sway prices to the lower end of the spectrum. 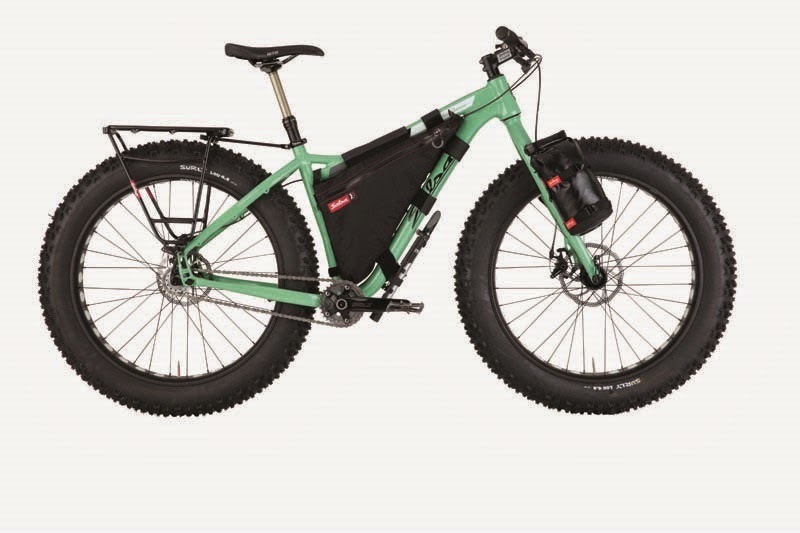 I just do not see how the fat bike market can sustain the growth and with so much new product coming online, it would seem that supply will be bigger than demand. Good for fat bikers, hopefully, that want new treads. GTDRI Update: Hopefully everything falls into place for me to get out to check on some of the new route I added in for this year's Guitar Ted Death Ride Invitational. I need to verify a few details as well. I just checked on the camping situation, and all reservable sites are gone, so there are a chunk of first come-first served sites that they hold back. There are showers available there. Cost per night for tent camping starts at $11.00 per night. It shouldn't be too tough to nab a tent site. I have heard positive reaction to the event in the form of verbal commitments numbering up to about a half dozen riders so far. The weather is looking fine so far, so I suspect that if the weather prognostications hold up, we will have a nice group at the least. I sure hope that my new camera shows up in time to take it along to get images from this ride. In fact, I hope it shows up before the ride with time enough practice and get to know it. If it doesn't, I may have to commandeer my son's camera! So I have been kind of yearning to ride the single speed on some longer gravel rides lately. The rig I have set up for this is the Singular Gryphon. Trouble is, other stuff has been pushing back the chances to get out there on this rig. Way back when before I got caught up in all this reviewing of stuff and what not, I would just ride a single speed on gravel for miles and miles and I was okay with that. It was simple and I had a lot of fun. Ideally I would have a lighter weight rig, but the Singular really handles riding on gravel well. I rode it at Gravel Worlds once and I thought it did really well. Plus I also have the Pofahl which I like for the same reasons. I figure that once everything settles down after the GTDRI I should have options to ride single speed gravel a lot more. I am certainly looking forward to that. The new ride I am planning for October, the "Geezer Ride" will likely be done on one of my single speed rigs. That's a short post but that's all I got today. Stay cool out there and get out and ride! This is a gravel road. We have over 69.000 miles of it in Iowa alone. 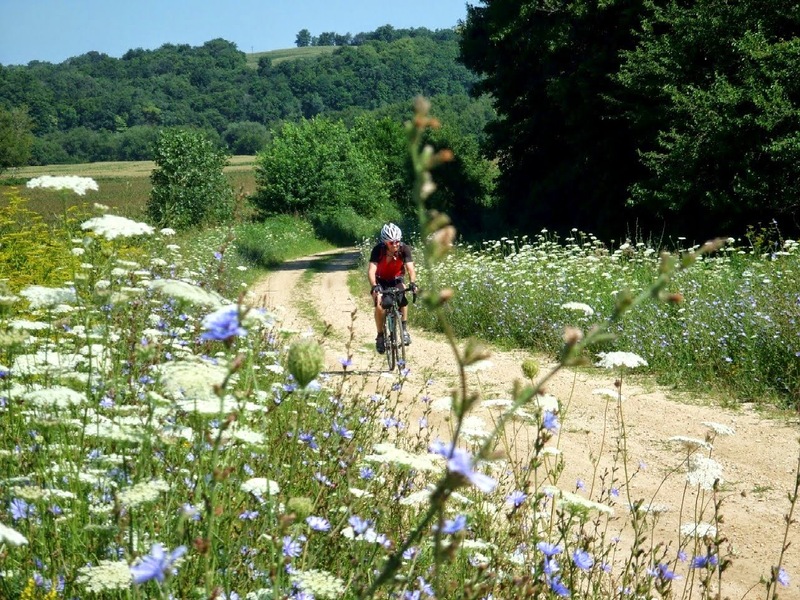 I have noticed of late that many bicycling companies have been bandying about the term "gravel grinder" again, and many media write ups of late have also been poking the badgers out in web-land with this term as well. I wanted to address this, (once again), and also point out what is and what isn't a bike good for gravel riding. I don't mean to come off as some smarty-pants know-it-all, but when you are born and raised in Iowa, you damn well sure know what a gravel road is, and what isn't a gravel road. If you were like me, you didn't even bat an eyelash at riding a bicycle on gravel, but that isn't the point. Yes, you can ride any bike on a gravel road, Captain Obvious, but you also could ride any bicycle on the Porcupine Rim Trail in Moab too, but you use a mountain bike, because it works better. And guess what? We know something other than a road bike, or even a cyclo cross bike, could be a better bicycle on gravel. That is the point. It is great that the industry is listening, but you don't have to. The industry is jumping on a trend, no doubt about it, and since when has that ever been a surprise? Well, you'd think that some folks had never recognized this fact by their reactions to "gravel grinders" as a term, and that they had never heard of "free ride", "NORBA geometry", "aero road", or "enduro" before. (I could go on.) You know, you could simply ignore and ride whatever ya want to. That is an option, ya know. I am stoked to see gravel bicycle design and components, for sure. However; it doesn't matter if it never happened at all. It just makes riding gravel better, and like I said, we all knew it could be better than using a cyclo cross bike, or a 29"er hard tail. In the end, it is just about riding though. That said, here we are, and companies are saying things about bicycles that are not really hitting the mark. They are using the term "gravel road", "gravel grinder", "dirt road", and other terms to describe bikes I wouldn't ever consider for any of the above here in Iowa. Their tires cannot handle gravel here with aplomb because they are too skinny, or their geometry is so close to cyclo cross that it isn't "road-like" at all. Look, it is called a gravel road. We are not going to hop barriers, ride in ruts, or need to pedal through corners at high lean angles. But don't listen to me. I'm just some old, grouchy bicycle mechanic at a small shop in Iowa. What the heck do I know about bicycle design? You know those racer guys, they have a much better handle on geometry and what works and what doesn't, so let's see what one of the most famous racers in the world right now has done to influence bicycle design that is one small detail away from being the perfect gravel grinder bicycle. I guess maybe ol' Fabian Cancellara knows what a rough road is and what kind of bike you'd use to tackle it. The Domane by Trek is an "oh-so-close-to-perfect" gravel road machine that I cannot believe Trek themselves haven't jumped at the chance to modify it slightly to fit what gravel road, rough road, and pavement riders around the world need in a bike for everything but true mountain biking. 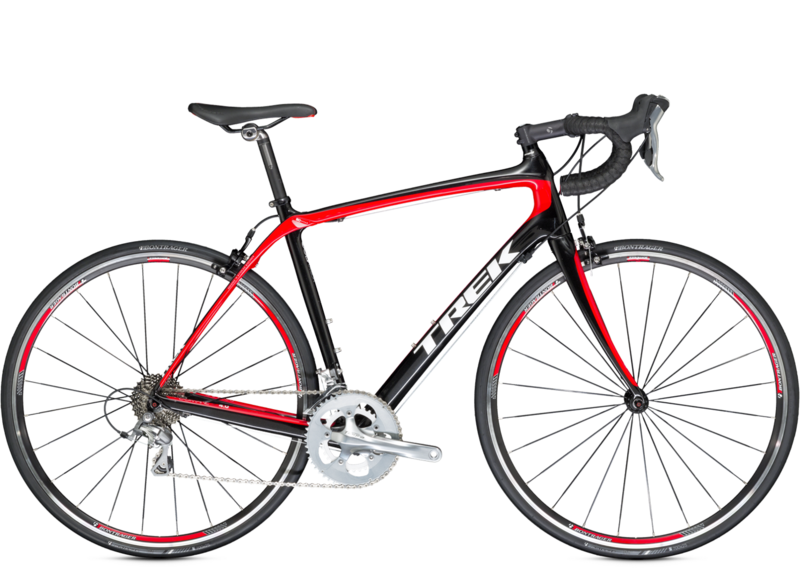 In fact, other companies than Trek have similar rigs that are super close to what I would design as a gravel road bike. Why give us lukewarm cyclo cross bikes? The Domane features a truly low bottom bracket. When you read about these other bikes pretending to be "all road", or gravel grinders, look at their numbers. If they are not below 70mm of BB drop, they are not really a gravel specific design. They are warmed over cyclo cross designs. The Domane has a BB drop of 80mm-75mm across the size range. Now that is a low bottom bracket! I totally agree with Fabian and Trek on that facet of rough road geo. It helps with stability, a major plus for a speedy, good handling gravel rig. The head tube angle is another place a lot of these so-called gravel road/dirt road bikes say they are "slacker" at. Really? The Domane has a 71.1° to 72.1° head angle across the range. Many of these other pretenders have 72.5° head angles and steeper. I think the Domane is borderline too steep, by the way, especially on the large end of the range. That said, Fabian probably knows a thing or three about what he wants in a front end geo for rougher roads. Then there is the brilliant de-coupler seat tube design which is an obvious advantage for the "paint shaker" gravel roads we have here. Even the chain stays aren't ridiculously short at 420-425mm across the range. (I'd go a bit longer, again for stability, but that's me.) 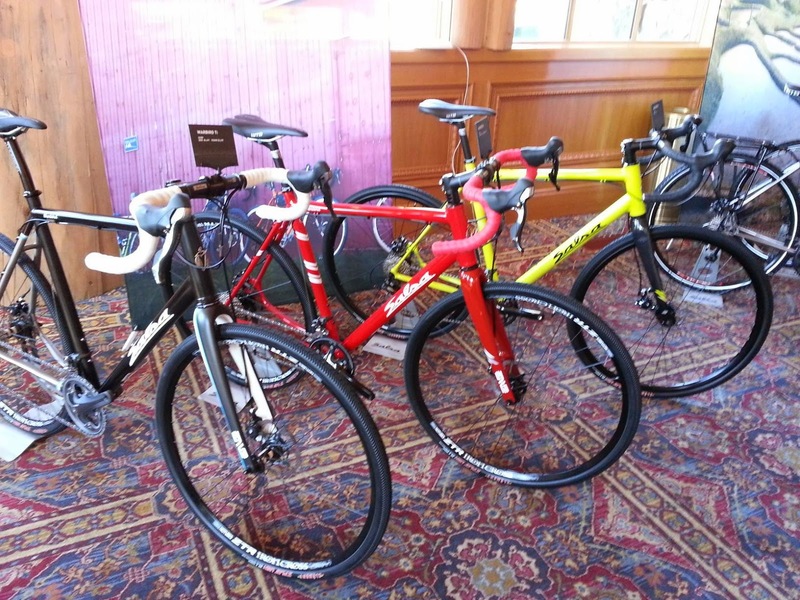 That said, there is one area that the Domane, and many of these other so-called gravel bikes, fail at. That would be tire clearances. If the Domane could handle a 40mm tire, it would be dead on perfect for gravel. Of course, add in the disc brake option that future Domanes will have and we're really looking at a winner at the rough road game here. So, there ya go folks. Measure these so-called gravel rigs from GT, Specialized, and others against the Domane, (keeping in mind we'd want bigger tires), and see how they measure up to Fabian's vision for a rough road rig. And oh, by the way- it's a race winning design as well.